Major Changes in MLQ Structure. At the February 12 business meeting Nancy Smith introduced an idea for a change in structure of our guild. The change would create more opportunities for the involvement of all members in planning events and monthly meetings, and thus take the burden of responsibility from the shoulders of a few. The suggested change received unanimous support of those members present, and the plans are to implement this new structure beginning with our June 2001 meeting. How it will work: Each month three guild members will work together to plan and host that month's regular fourth Monday evening meeting. This planning committee will be responsible for selecting and presenting the program topic, and providing refreshments for that particular month. The committee may choose to present a program themselves, or they may use outside resources for programs -- guest speakers, videos, etc. Names will be drawn at random to determine the committee members for each month. If your name is selected during a time that is not convenient, you may trade with someone else. We will put together a calendar for the entire June 2001-May 2002 guild year, indicating who will be responsible each month. In a related vote, we decided to extend our guild calendar to include meetings in July and December, months during which we did not plan meetings in the past. Other offices: We will still seek to fill the positions of MLQ Chairperson, Secretary, Treasurer, and Charity Quilt Chairperson. The new structure eliminates the position of vice-chair. Everyone will be given the opportunity to express your interest in any of these positions at the February 26th meeting. Monday, February 12, 2001, 7:00 PM. Sew What/Business Meeting. Saturday, February 24, 2001, 2 PM. Weekenders Clothing Party, at Waterford Mennonite Church. This is a fundraising event for Maple Leaf Quilters. You'll love the comfortable and easy-to-care-for clothes available through Weekenders. A percentage of what you spend will go to our treasury. Guests are VERY welcome! Monday, February 26, 2001, 6:30 PM. Machine Quilting with Connie Ozinga. Bring your sewing machine. For more information about Connie's class, click here. Monday, March 12, 2001, 7:00 PM. Sew What/Business Meeting. Saturday, March 24, 2001, 9 AM- 4PM (with lunch break). Help is Here for EQ4 Seminar with Barbara Vlack. This is a hands-on opportunity to learn from a great teacher and Electric Quilt software expert. We will be using a computer lab for this seminar so each person will have the opportunity to follow along step by step on a computer, creating quilt designs with EQ4. If you own this quilt design software and would like to become proficient OR if you are considering purchasing this software, you won't want to miss this seminar. Space is limited so sign up now. The cost is $40 for this six-hour seminar. For more information, please contact Nancy Smith, at 293-3846 or e-mail Aztech.@prodigy.net. For more information about EQ4, visit their web site: http://www.electricquilt.com/. Nancy reports that as of mid-February there are only 4 spots left in this workshop. If you are interested and have not signed up, do so soon. Monday, March 26, 2001, 6:30 PM. Regular Meeting - Relief Sale Quilt work night. CHARITY QUILT PROJECT. Fran Hathaway has agreed to head up the Charity Quilt Committee. Our first offical project for 2001 is making blocks for a quilt for the annual Michiana Relief Sale in September. This will be our third consecutive year providing a quilt for the auction. 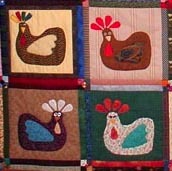 We've decided to make a whimsical quilt this year using the hen pattern, shown here, from the book Whimsies and Why Nots. Information and patterns are available from Fran. The original deadline for the 12 1/2" blocks was the January 22 meeting. If you aren't done yet - please hurry. We need all the chickens we can get!!!! January - April, 2001. Quilt Classes sponsored by Yoder's Department Store, Shipshewana. Patty Sliney is teaching a number of quilt classes for Yoder's. Classes are available for every skill level. For a schedule of classes in January - April, click here: Class Schedule. For a description of the classes available, click here: Class Descriptions. For additional information email Patty at hoosierquilt@aol.com. March 1 - 3, 2001. 10th Annual Indiana Heritage Quilt Show, Bloomington Convention Center, 302 S. College Ave, Bloomington, IN. For more information, visit their web site at http://www.ihqs-quiltshow.org. This is a major quilt event in Indiana, featuring nationally known award-winning teachers. March 17, 2001, 8:30 - 4:00 PM. Gathering of Quilters 2001, hosted by Creative Threaders, to be held at Cordier Auditorium, Manchester College, North Manchester, IN. Speaker: Beth Ferrier, Designer and Lecturer. Ticket information is available from Lana Dowell, P.O. Box 480, North Webster, IN 46555, phone 219-834-4811. As in the past, Maple Leaf Quilters will plan to send in a group registration. We will collect information on who is planning to participate. Cost is $12. and includes lunch if you pre-register. Saturday, April 21 & Saturday June 16, 2001. Watercolor Quilt Classes at Lolly's in Shipshewana. Carol Honderich will be teaching this one-day class at Lolly's. A fabric kit will be provided in spring or summer colors. For more information or to register for a class, contact Lolly's at 228 West Main Street - P.O. Box 277 Shipshewana, Indiana 46565. Phone 219-768-4703 or 1-800-773-2119. You can visit Lolly's at http://www.lollys.com/. May 1-6, 2001, 25th Annual Quilt Fair at Sauder's Village. In addition to classes taught by Debbie Caffrey, this year's events include a special exhibit of quilts, "Living Outside the Lines," by Ann Stamm Merrel (1951-1999). Ann grew up in the Archbold, Ohio area, and moved to California as an adult. She was for many years a regular participant in Sauder's Quilt Fair workshops. She was a talented artist whose quilts frequently hung in Sauder's show. Ann died of breast cancer in December 1999. For more information on Sauders Village, check out their site: http://www.saudervillage.com/. FAVORITE ONLINE QUILT LINKS. In each edition of this newsletter I've been featuring an favorite quilt site on the Internet. This month's link features Jeri Culler, sister of our own Janis Nelson. Jeri's site offers some unique goodies and gifts for quilters. You can also buy Janis and Fran's patterns at this site. Too Cool! Visit Imagine That Gifts: http://www.imaginethatgifts.com/.